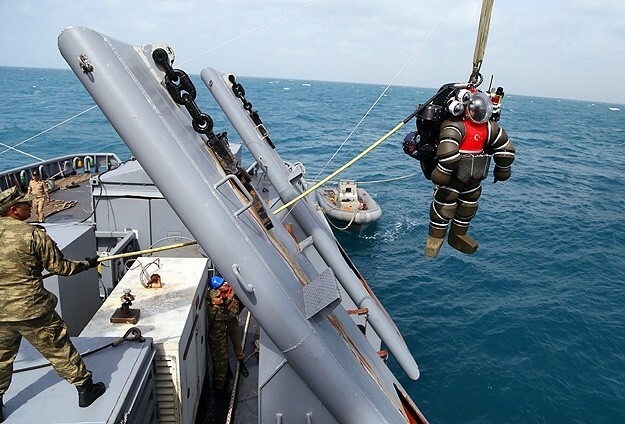 Last week Turkish Navy demonstrated its underwater search and rescue capabilities by using an atmospheric diving suit (ADS). According to the training scenario the Atılay class submarine TCG Dolunay at a dept of 100 meters, released her distress buoy 13 miles off the coast of Mediterranean city Mersin . When the news of the distresses submarine reached the HQ of the Salvage Command of Turkish Navy the ADS , its pilot and the support crew were flown to İncirlik Air Force base in Adana. From here they were brought to Mersin harbor and loaded to the tug A-590 TCG İnebolu. When TCG İnebolu arrived to the location of the distressed submarine, the ADS was lowered to the submarine. The pilot inside ADS connected fresh air supply from the surface to the submarine. The circulation of the fresh and used air is vital for the bottomed submarine until further rescue equipment arrives to the scene. The ADS known as Hardsuit Quantum 1200 by its manufacturer, Oceanworks, is in operation since 2007 and can operate till 365 meter of depth. Although it is very risky to submerge a person to such depths having a human on the scene can have some advantages over using ROVs. A similar ADS with a higher depth rating (600m) will be on board of the submarine rescue mother ship (MOSHIP) A-601 TCG Alemdar when she is commissioned.